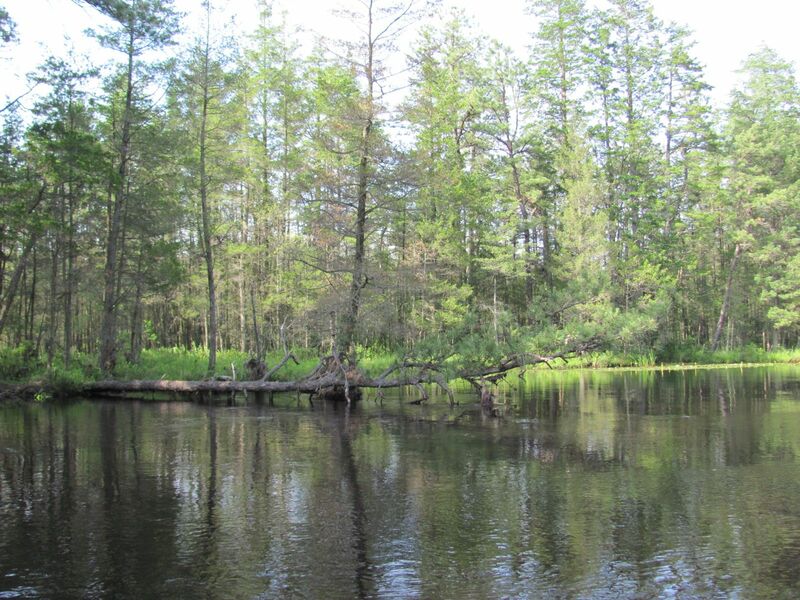 Exploring the New Jersey Pine Barrens has been an ongoing adventure, and there are plenty of places to go. This one location was selected because a pamphlet that we picked up the last time we visited a New Jersey state park stated this lake was one of the most serene places in New Jersey. 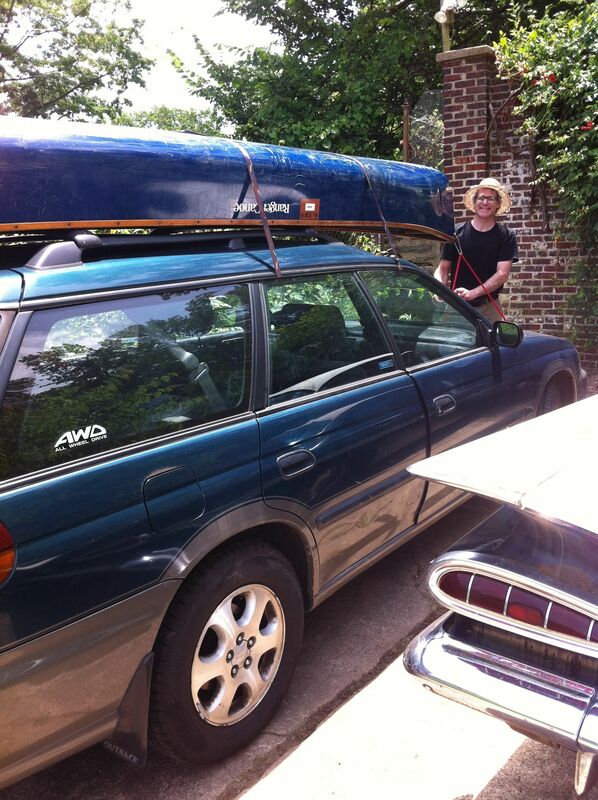 A compelling description, enough of one to get us to remove the canoe from the basement and strap it onto the Subaru and drive the whole hour and a half from Philly to this exquisite lake situated in a very remote part of the State. 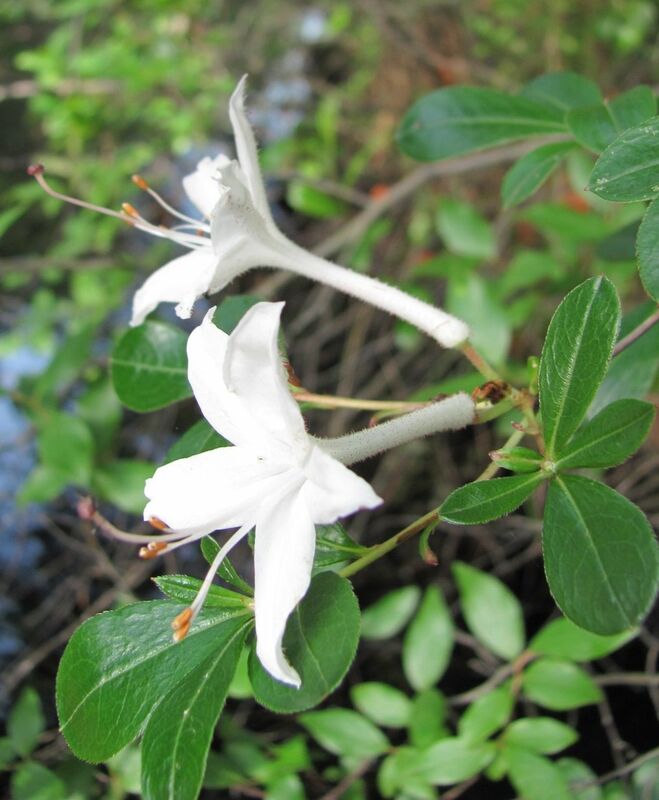 We had some ideas about what to expect, being that we canoed the nearby Mullica River this time last year and found lots of Blooming Swamp Azaleas (Rhododendron viscosum) along the river. 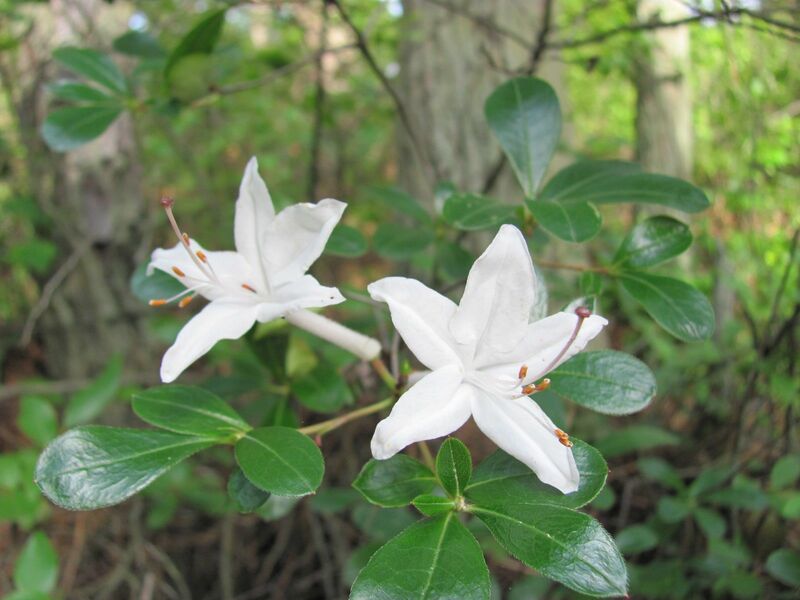 We hoped to see this native Azalea in bloom this time around. 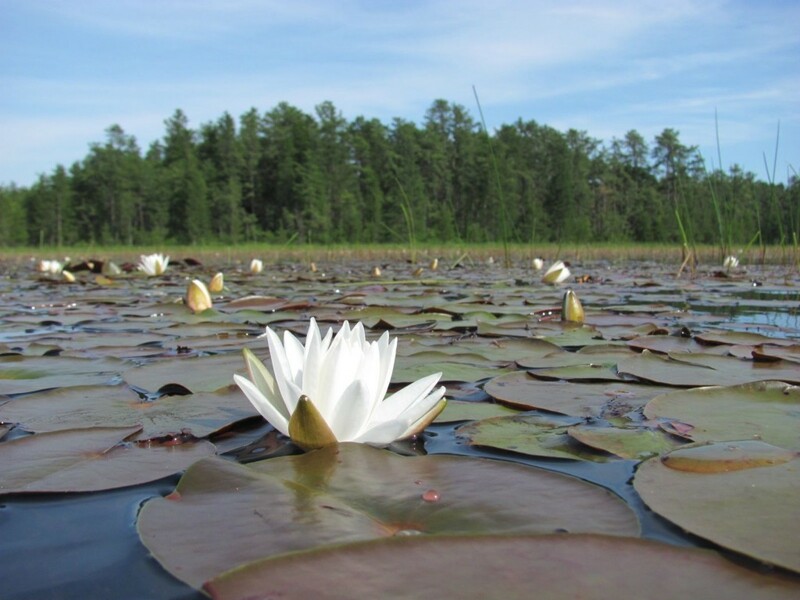 Once parked in the Parking area along the lake, getting the canoe in the water was effortless, and all of a sudden we were out there on the pond, having very little expectations except to see some blooming Swamp Azaleas and those gorgeous white flowers. 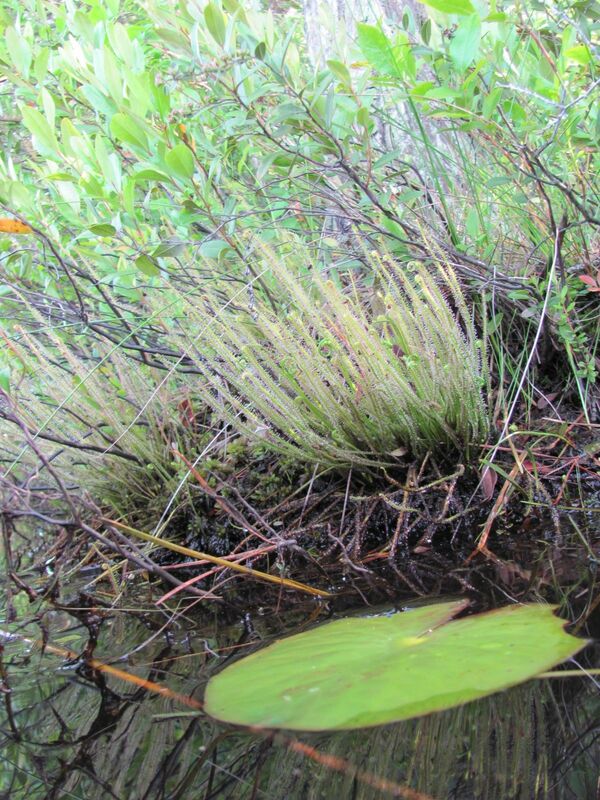 We wondered about the grasses growing out of the water as seen in the first picture. 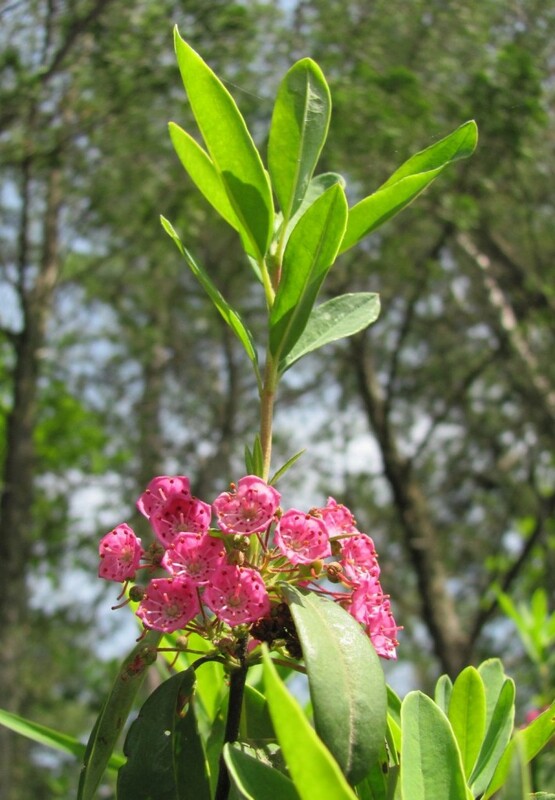 We moved toward the shoreline at one point because we were attracted to the pink flowers of the Sheep-Laurel (Kalmia angustifolia) pictured above . After several minutes of admiring the shrubs, we slowly proceeded along the coastline until something caught our attention. It was a plant that was so unique and odd-looking that it stuck out from the others in a crisp, defining way, jumping out of the plant-scape really, something so graphically distinct it had become a landmark botanical discovery for us on this fine day. This Plant, which we had seen once before in cultivation, at the Norcross Wildlife Sanctuary, in a setting very similar to the setting we have found ourselves in, we recognized instantly, and we were joyous at having un-expectantly found it on this pond-side shoreline in its natural ecosystem: The Pitcher Plant! 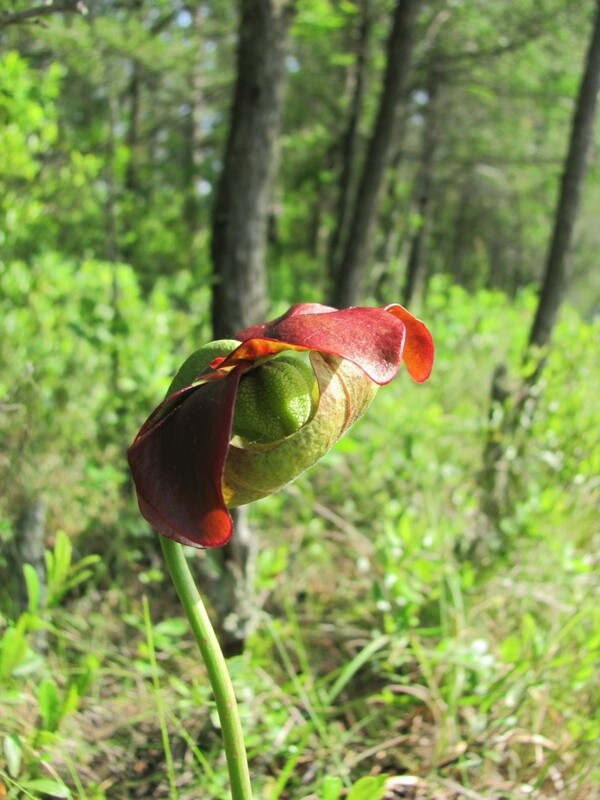 And the Pitcher Plant is even Blooming as well! This was a magnificent sight! We had heard about these plants from the botanical enthusiasts we met at Shenks Ferry Wildflower Preserve and read about them in books; they have a legendary place in the botany of our region, and to find them for the first time while not even looking for them gave this experience a revelatory quality, as if we were explorers with an eye for botany, but with few pre-conceptions or expectations. This plant was now on the stage of our attention! 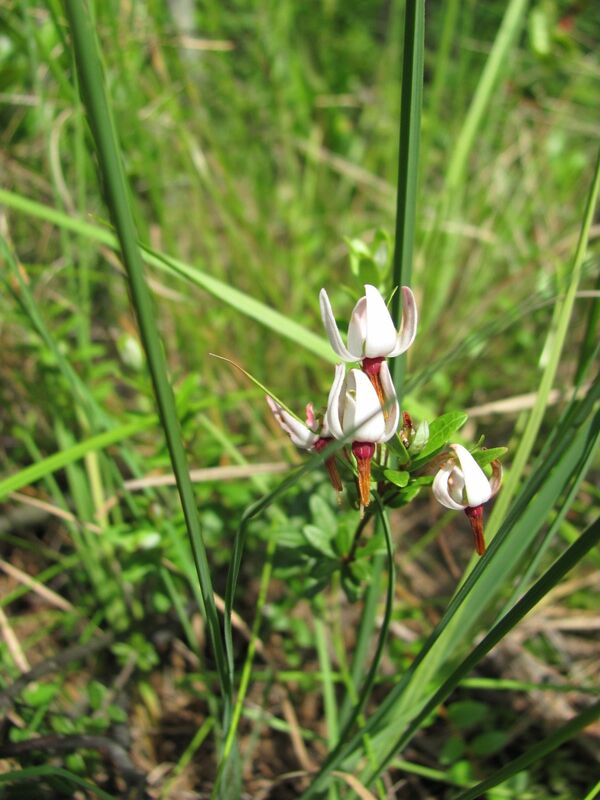 The whole plant, photographed to document its habit and size, its neighbors, the whole environment. 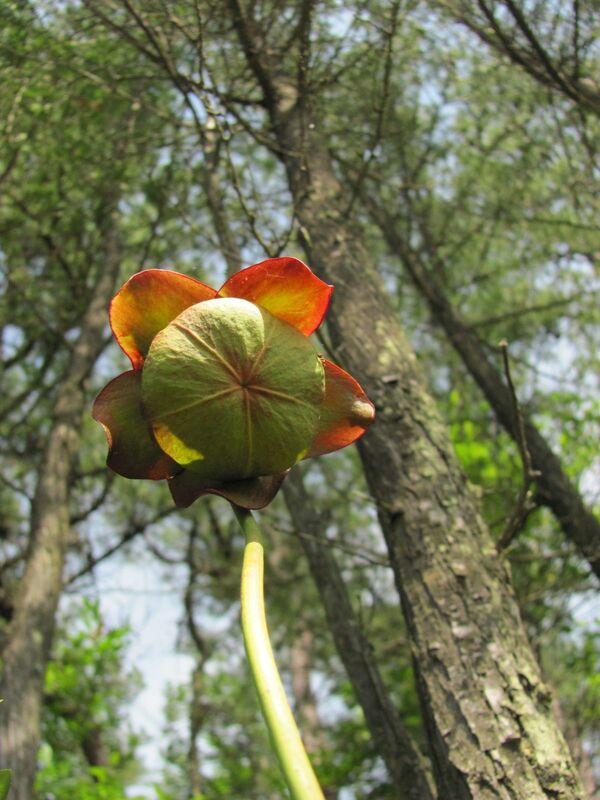 And above the side view of the flower and below, the part of the plant that captures insects. 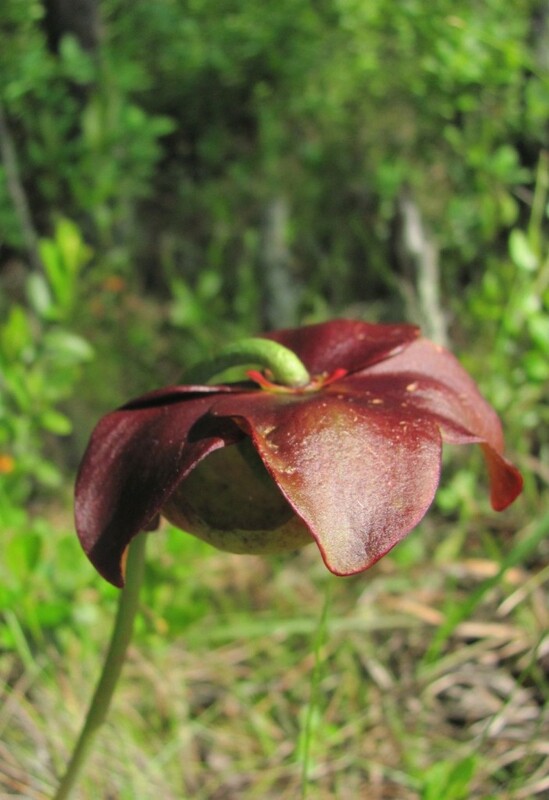 In this stage, the plant has created a flower as well, to attract pollinating insects, so that it may exchange pollen with other Pitcher plants, assuring a diverse and healthy genetic make-up for its seeds, a necessary component of its survival. The very idea of a carnivorous plant is intriguing indeed-usually it’s the other way around- carnivores eating plants for their survival, like us humans. 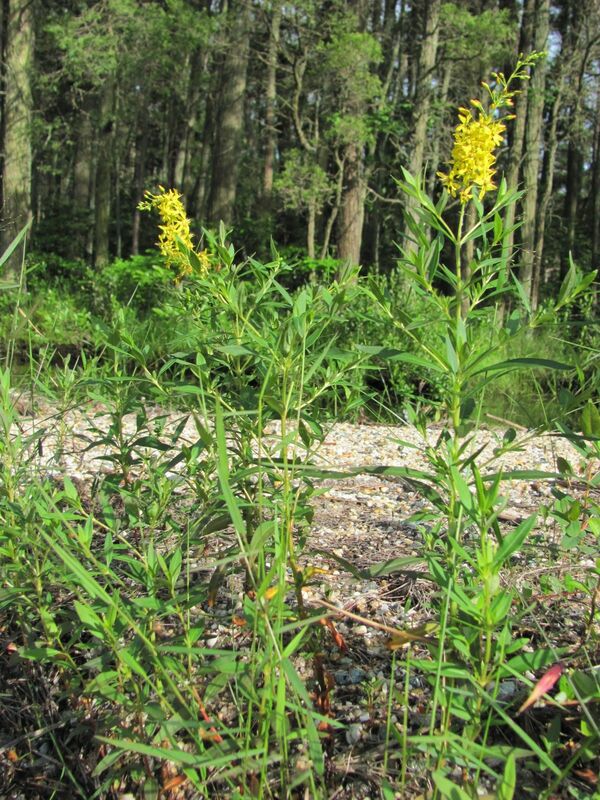 In New Jersey, there are plants that eat meat, we can say. Evolution of species, on the center stage! 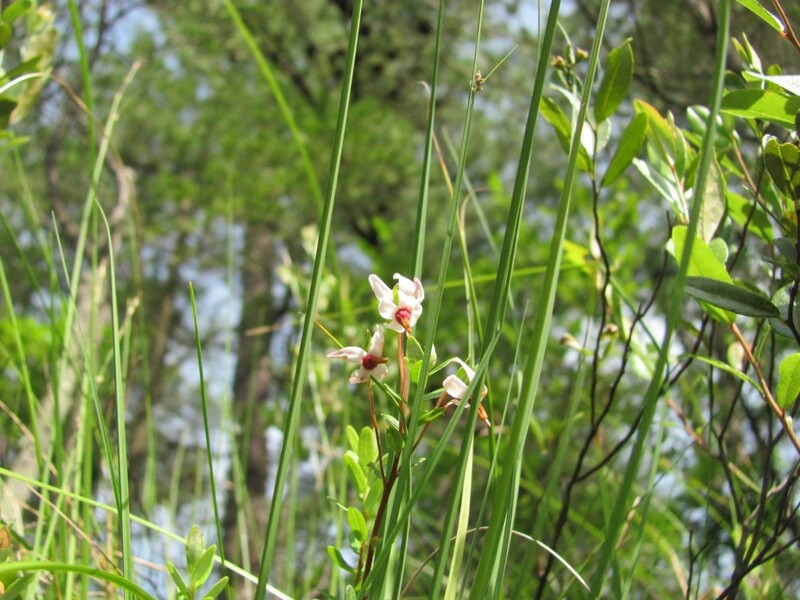 Growing alongside the Pitcher plant is the Cranberry, flowering. 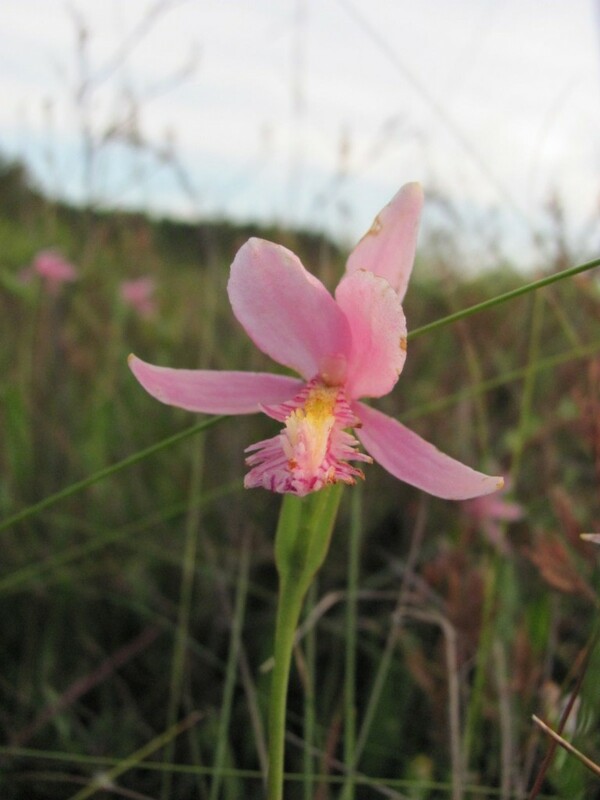 We were immediately reminded of the Shooting Star, (dodecatheon meadia) upon seeing the Cranberry flower. 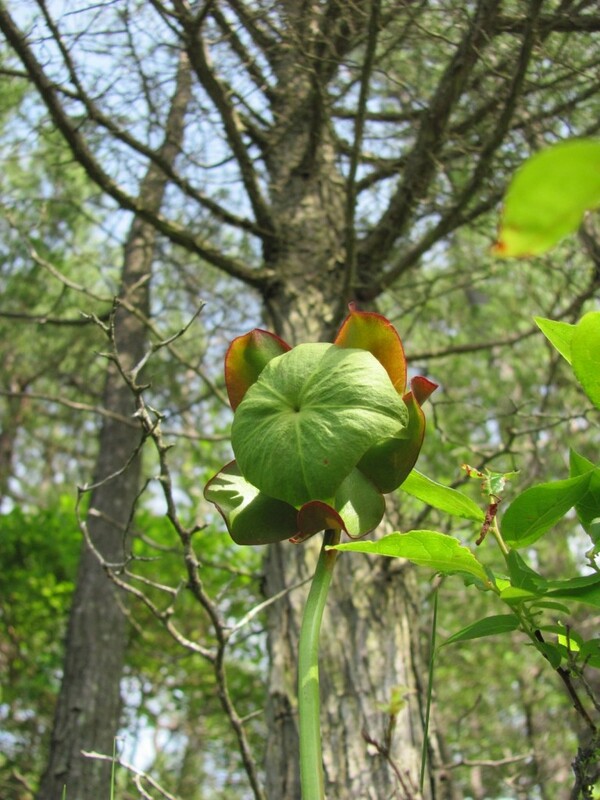 Below, the Pitcher plant and its bounty of ants caught inside the leaf. 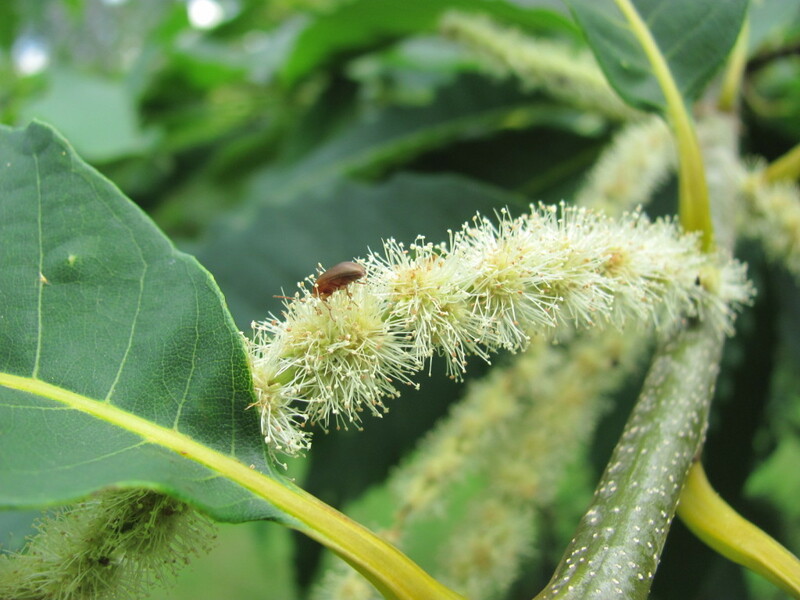 The ants will be dissolved in a ‘soup’ of enzymes secreted by the plant and this nutrient-rich soup will sustain the plant in this nutrient-poor soil. 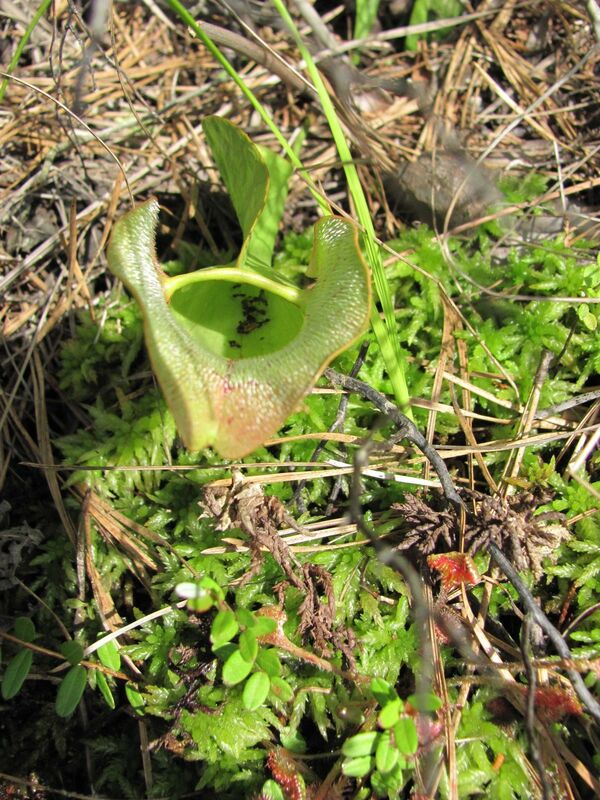 Note the moss growing in association with the Pitcher plant. Also to be noted is the structures on the outer portion of the leaf. What a startling and magnificent discovery! 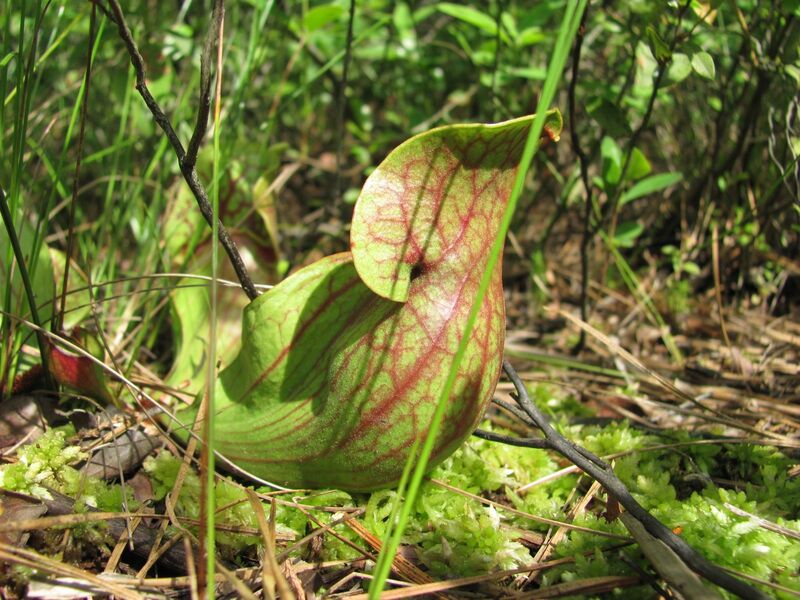 This is the scene where we found the Pitcher Plants, growing in a very sunny location on the edge of Harrisville Pond. 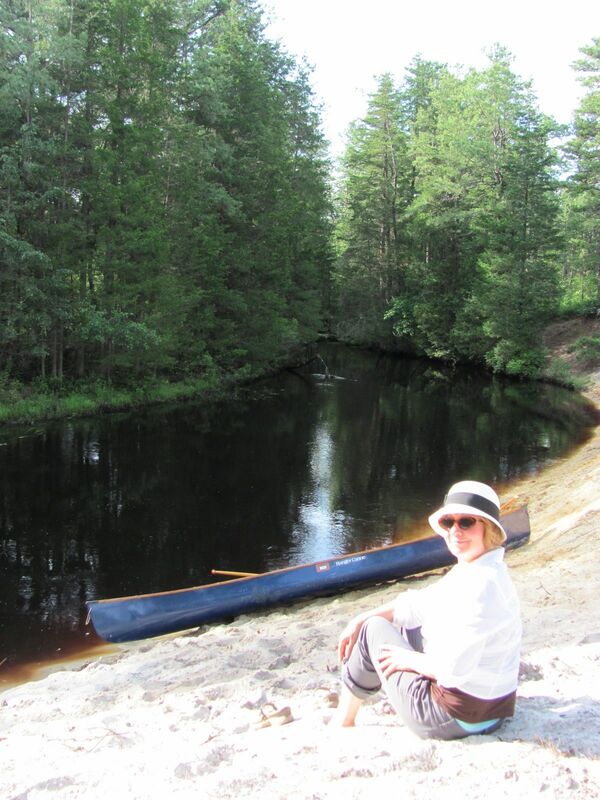 The canoe has proven to be a very useful tool in viewing interesting plants and habitats. The boat is big enough to store lots of food for a picnic, camera equipment, hats and pillows as well as provide an extra seat for guests! This Fragrant Water-Lily (Nymphaea odorata)was blooming, captured by holding the camera at water’s level, almost touching the Lily Pad. 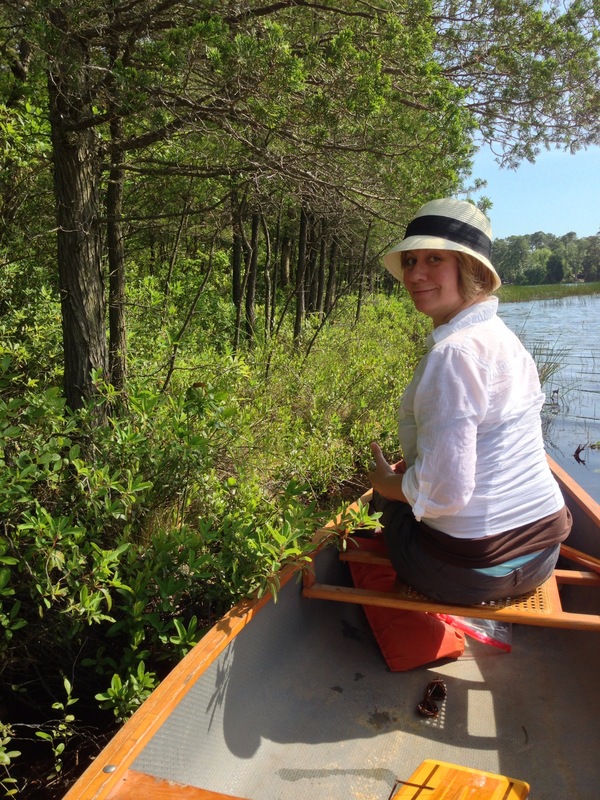 We rowed across the pond and found a serene area of plants growing along the water’s edge. 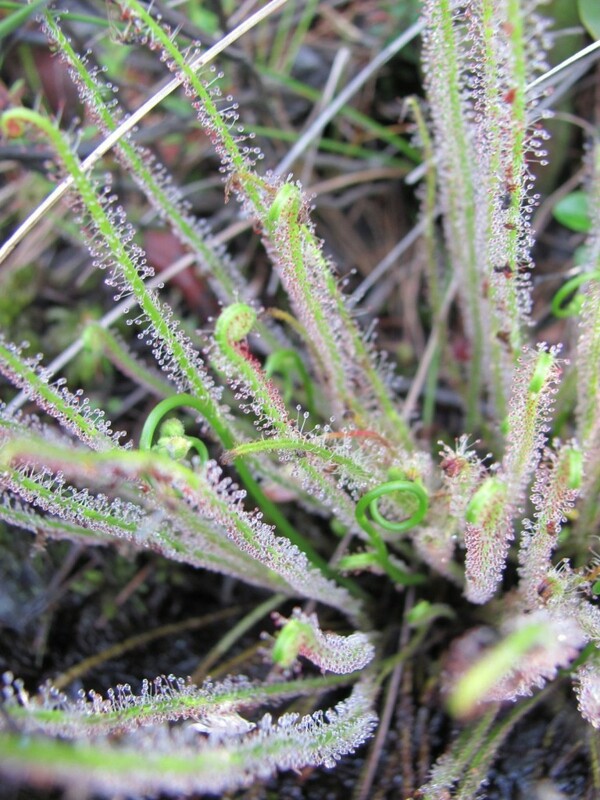 We discovered for the first time, new carnivorous plants! This day was none other than the botanical parade of interesting plants, one after the other after the other! 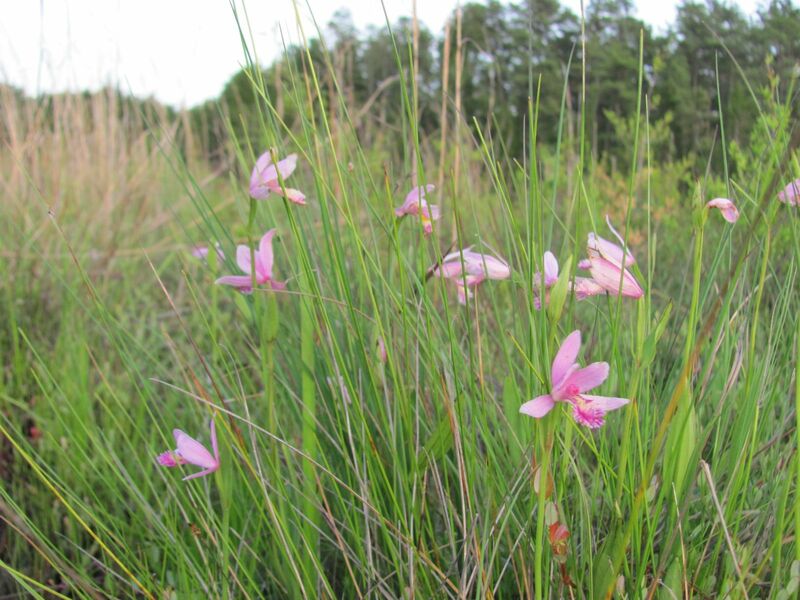 The whole time we were ensconced in the pleasant, sweet aromas of the blooming Swamp Azaleas, growing in association with the odd and exciting carnivorous plants we were discovering on this banner day. Not expecting them added a level of exoticism to our experience; there is something to be said for an educational path that is unique and creative, where discoveries are made in a fresh and independent way, such as ours this bright, late June day. It does help to have a back-round in science and academic process- the subject may be new, but the analysis of the sight gets us asking the right questions, and this is a great help in understanding this place. Scientific thinking is a great way to connect with a habitat-often there are species we already know and somewhat understand nearby, and this gives insight into this new habitat- in science, there are doors of knowledge that can lead us into uncharted territory, because nature is all connected together. One thing always to remember about the Earth, it that it is super old as far as we are concerned, so old that it is very difficult to really comprehend the ongoing geological processes that change the planet. Trying to comprehend them is very rewarding. 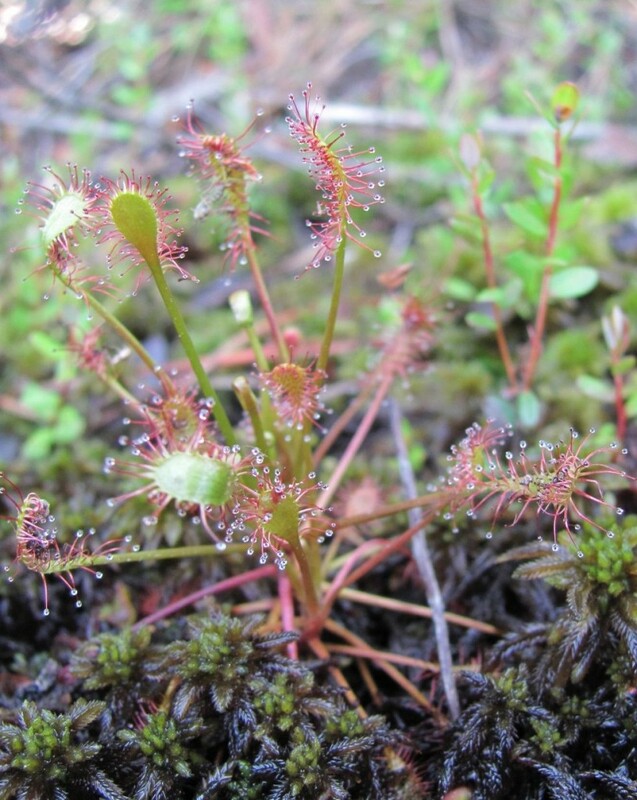 Every discipline connects to the others- Geology to Botany, for example, in just one plant, the Droseras of the New Jersey Pine Barrens-a sandy environment from the receding of the ocean, an old beach, imagine that- but a young and not very fertile habitat for certain plants, so such a place for carnivorous plants! Interesting how these plants ended up here given the geologic history of the place. 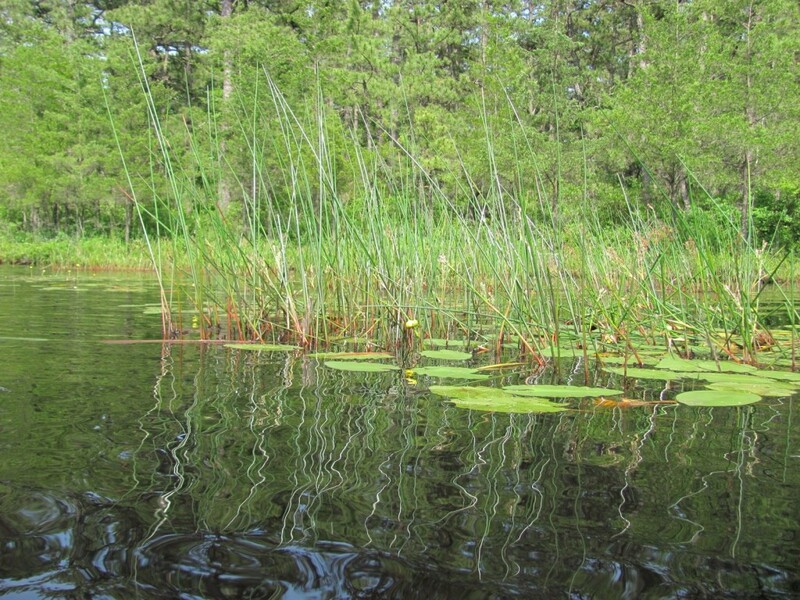 Visiting the Pine Barrens of New Jersey is like going to the shore of another era and seeing in real time what happens when the shore has receded away in time and what happens behind this natural geologic process-the crashing waves of the ocean are long gone and the new quiet of the new Jersey Pine Barrens emerges, along with whole new ecological systems. 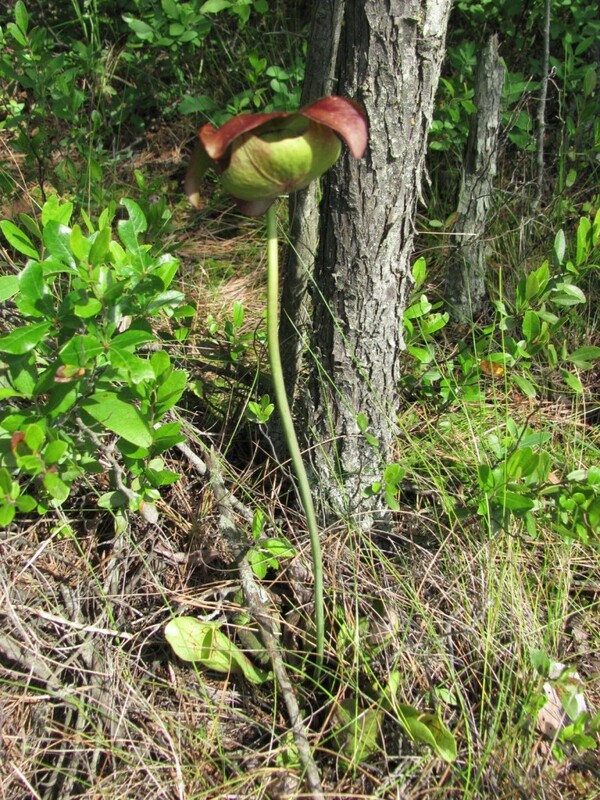 Along the way, over thousands of years, the pitcher plants and the carnivorous Droseras, the Sundews, establish themselves on these quiet, inland and sandy once upon-a-time beaches! 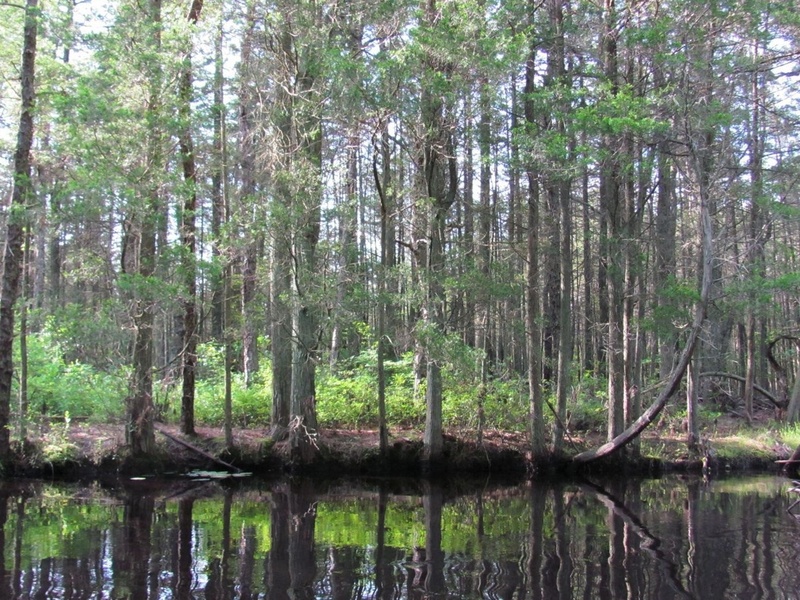 We left Harrisville Pond and headed up the Oswego River for more adventure in search of more Swamp Azaleas and unique discoveries. Great views were discovered along the way, often prompting us to stop rowing and letting the canoe drift a bit in the quiet waterway. 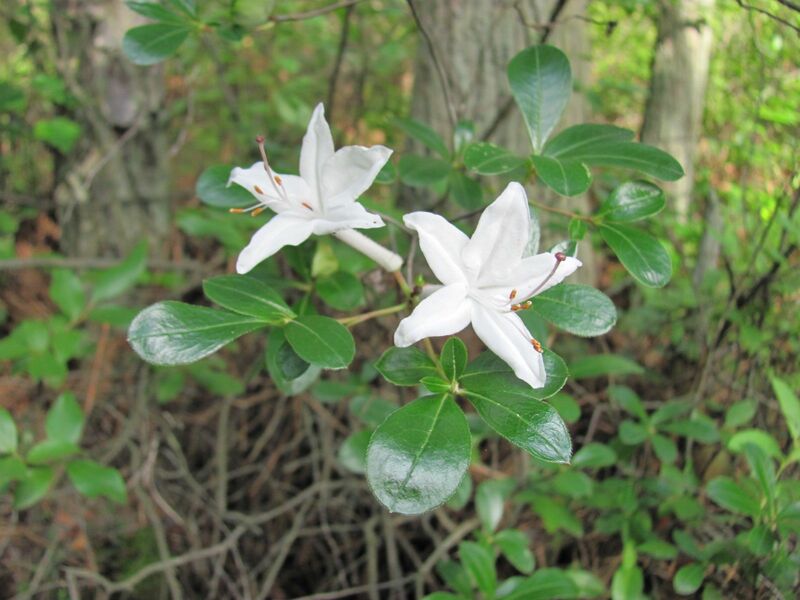 And here we are with the Swamp Azaleas, blooming away, the Rhododendron viscosum, the shrub that attracted us to these sandy inland pond shores and rivers of the New Jersey Pine Barrens in the first place! The sweet fragrance is magical, wafting through the air all along. Our first ever and only experience with this magnificent shrub is as a garden specimen we purchased several years ago, which blooms every year in our yard, filling it with it’s sweet scent. This specimen was purchased at Redbud, Native Plant Nursery. For us, to experience one blooming in nature is our goal and pleasure! We still have a few exotic, cultivated Azaleas in our yard, old specimens that came with the property, and bloom brightly for about a week. They do not have the fragrant aroma of these native ones, nor do they have the cachet of authentic locality that these indigenous beauties bring to our yard. 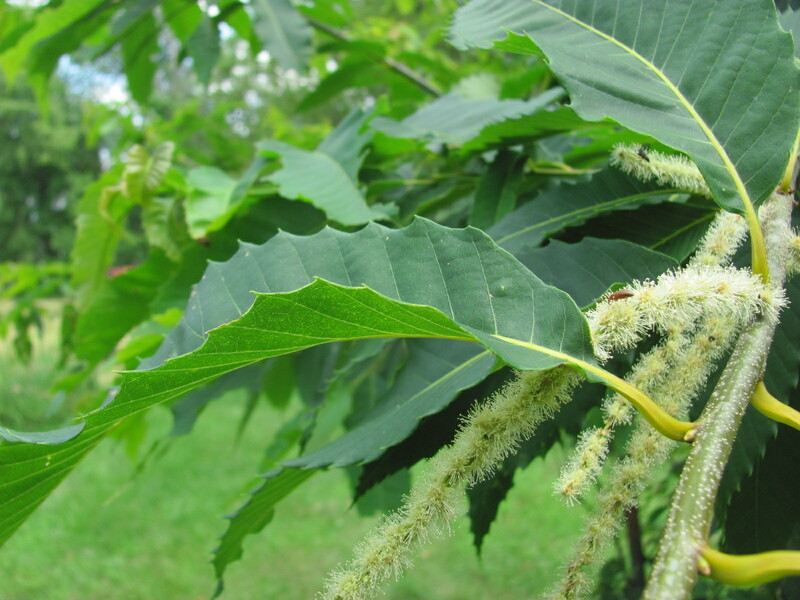 On this topic, growing the same plants that grow in the natural areas nearby in our own garden is a great pleasure and experience, as well as an interesting challenge: can our yard be as natural as the nature around us? 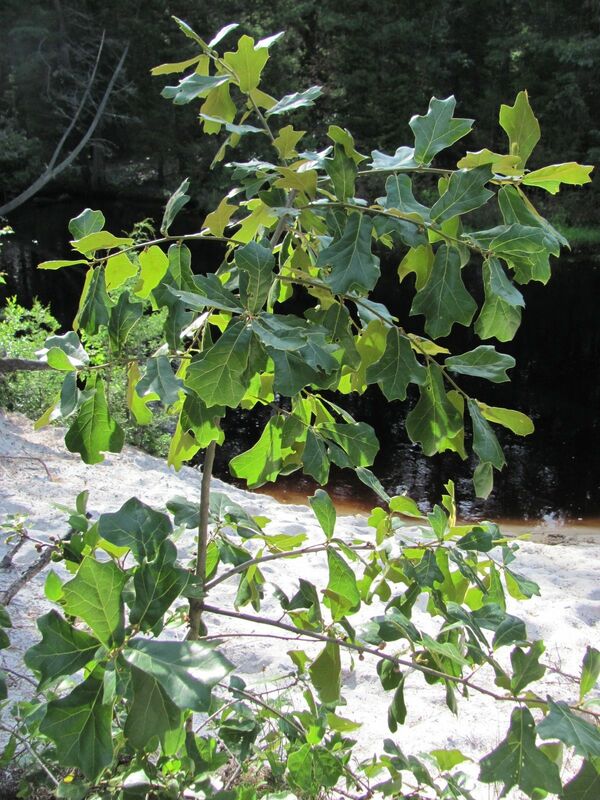 Enough to support these natural plants which have been here for thousands of years? 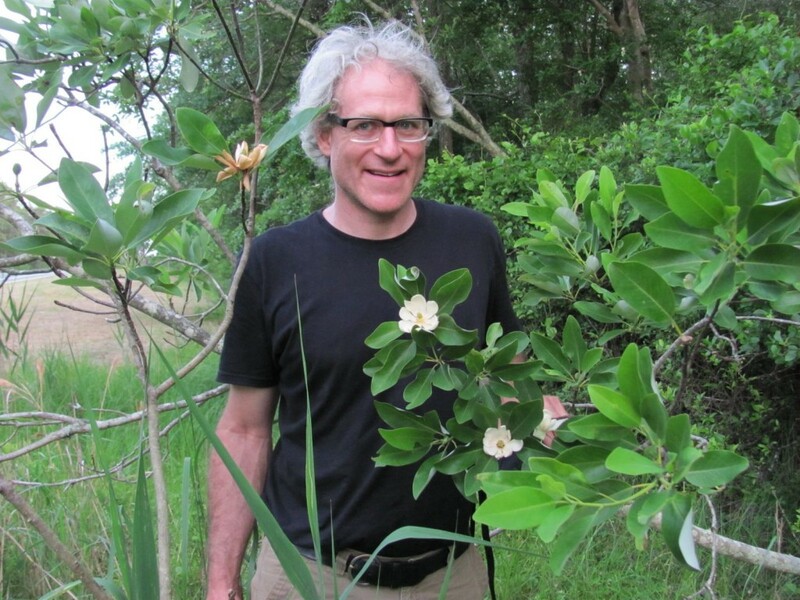 Also, isnt it really amazing that we can grow this shrub as an ornamental part of our front yard, enjoy its visual and olfactory qualities, and be satisfied with it as a garden plant, and contribute to the natural ecosystem, providing nectar for the insects which in turn feed the birds that depend on them for survival? 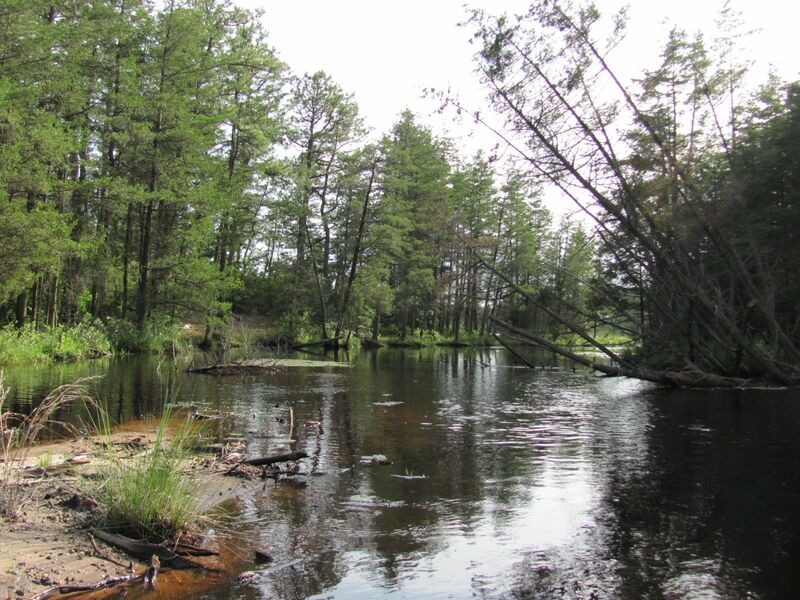 In a way, our adventure in the Pine Barrens of New Jersey is really a deeper look into our own garden. We continued up the Oswego River and stopped at a beach. We ended up changing a tire for some unfortunate Pineys stuck on a dirt road near the Beach. 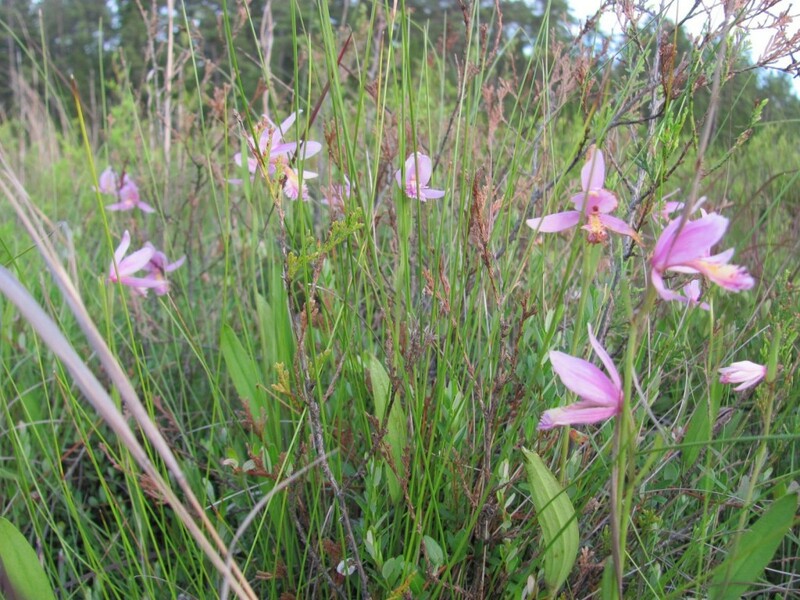 We turned back around and headed for the Pond, and this time we hugged the eastern shore, and made a fantastic discovery of Orchids blooming in the late afternoon sun, their delicate petals luminous in the fading light. Lastly, on the drive out of the Park, we discovered the blooming Sweet-Bay Magnolia along the side of the road, another bloomer with a very pleasant fragrance! 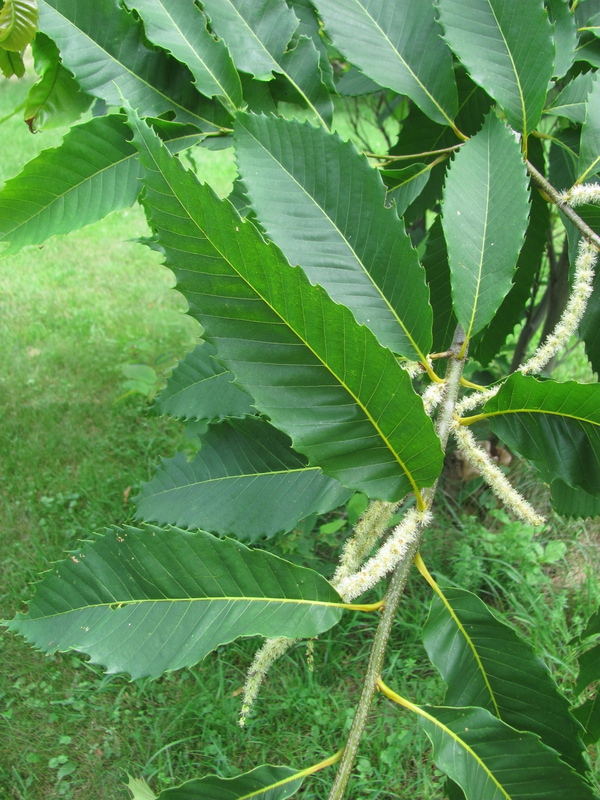 A blooming event for an American Chestnut planted about ten years ago in the Solomon Gardens in Monson, Massachusetts. This tree has been tended yearly by Sanguine Root staff Sean Solomon and Isabelle Dijols. 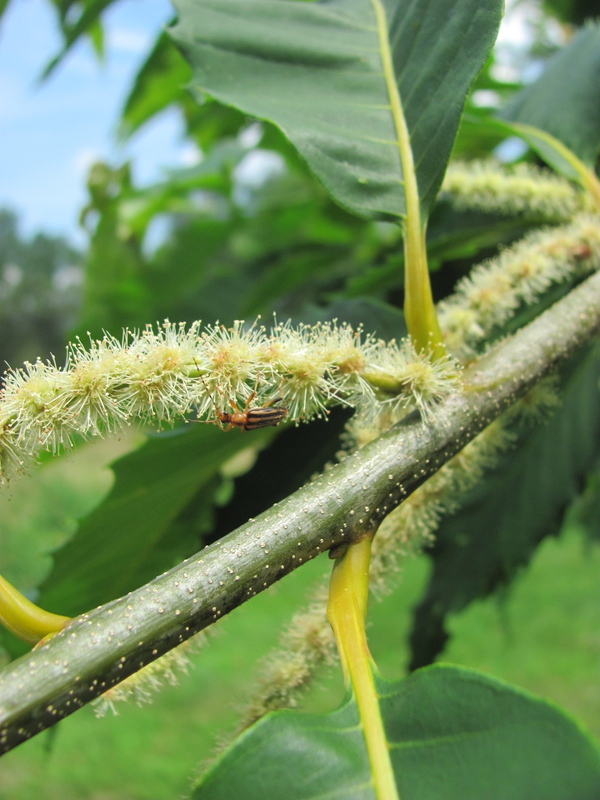 On this hot and humid July day, pollinating insects are found on the numerous flowers. 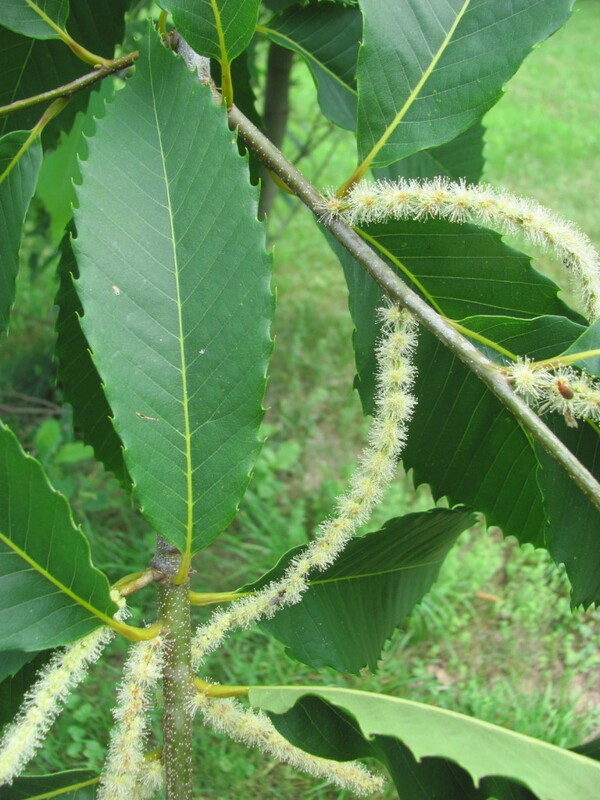 This tree has gone through various stages of flowering, fruiting and blight, being reduced from a small tree to a small shrub and then back again over the years. This trunk appears unscathed by the blighting fungus, however, the bark is disfigured a few feet below this spot, pictured above. 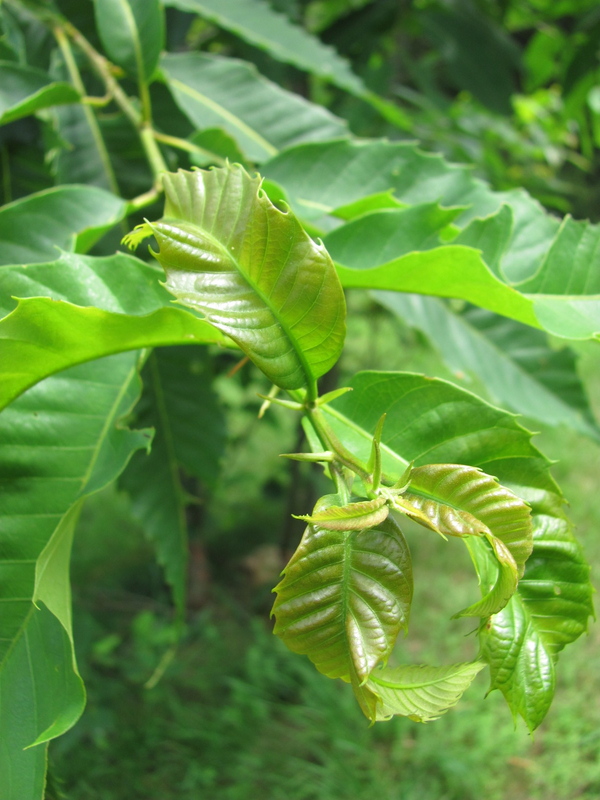 Young leaves unfurl at the end of the branches. 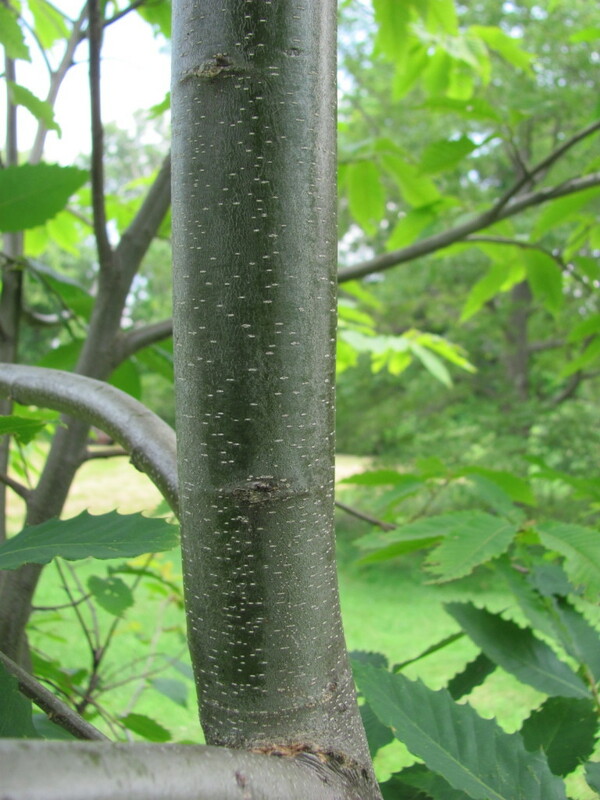 Sadly, the tree will most likely die back after it produces fruit, being that it will use most of its resources in this process, leaving it vulnerable to the fungus. By next year we will be cutting off all of these branches so the still-living roots can grow back up, possibly flowering again in a few years.